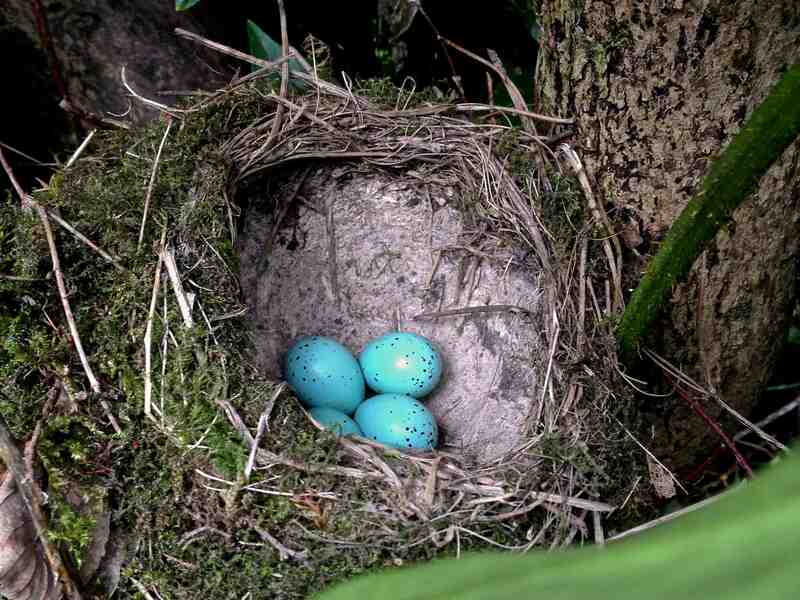 Categories: acres, castle, country house, countryside, gardens, moving, scotland | Tags: birds, eggs, nest, thrush | Permalink. We’ve got a ridiculously small kitchen for such a big house. It’s on the first floor in what we’re told used to be the butler’s pantry and our long-term plan is to put it back where it originally was. It’s an ongoing discussion as the old kitchen (just an empty room) is on the ground floor quite separate from the rest of the house (just like a servants kitchen ought to have been) but it’s not necessarily the obvious place to put a kitchen now. Our instincts say it will make sense of the ground floor plan as the rooms down there might otherwise be a bit defunct and there are other advantages to having it where it used to be, like a huge bricked up old fireplace that we’ve yet to take a sledgehammer to (one for next year) – and a flagstone floor underneath an old carpet. The flags are in a bit of a mess – dirty and flaking and mostly covered in what looks like carpet glue but no obvious damp patches. As we don’t really know what to do with them I’ve spent ages trying to find someone to come and give us a bit of advice. Apparently good stone masons are hard to come by and when I did manage to get hold of someone he said the only way to get rid of the glue was sanding – so he came today to do one of the flags with a machine. But it wasn’t a good idea; what was a mottled dirty old flag now looks like a plain flat slab of grey concrete. I feel bad about it and hope we can find a less drastic alternative. It’s a strange thing taking on this house. We both feel there’s some history here that we want to look after or reinstate if we can. It’s not that we need to be conservationists exactly – but just that we need to take care. So I’m having to reign in my tendencies just to get things done – we’ve taken on a massive project and sometimes finding the right solution is just going to take a while to work out. 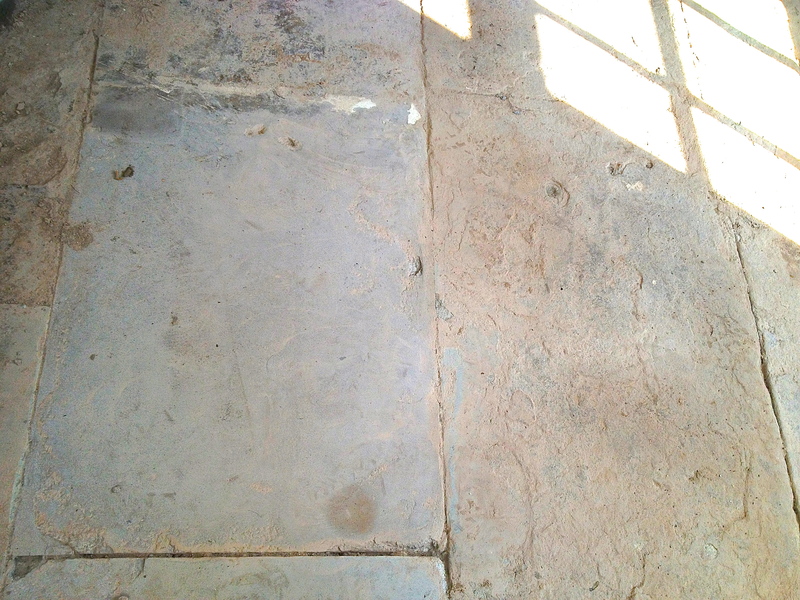 Categories: castle, country house, moving, renovation, scotland | Tags: flagstones, floor, kitchen | Permalink. Categories: country house, moving, scotland | Permalink. Loads of dog walkers use our drive which is all very nice – but one of them is bagging up their (biodegradable) dog’s poo and disposing of the black plastic bags by throwing them into our bushes/ trees/ general greenery. They have mostly landed at various inaccessible heights and there they remain in full view – and will no doubt continue to do so for hundreds of (non bio-degradable) years. This bizarre behaviour is sending Ed and I round the twist and we find ourselves mulling over how we might identify the culprit. These range from polite notices – “Polite Notice: Please take your f*****g dog poo home with you – you moron..” to sending off the poo for DNA analysis, DNA matching every dog in the village and then dumping all the bags in the owner’s front garden! Categories: acres, castle, country house, countryside, moving, scotland | Tags: dog poo, dogs | Permalink. We still haven’t unpacked everything yet because there are too many other urgent things to see to. The lawn is one of them and it’s our (Ed’s) first big job. It’s over an acre in all. It’s mostly moss, apart from the molehills (see Counting Molehills Apr 25) with varying patches of grass poking through. It’s so spongy we leave our footprints behind when we walk on it. This apparently is not a good thing, although I’m not sure I would have realized for quite some time unless someone had pointed it out. Ed says it’s too soft to use for much and gets boggy. Neither of us have had a lawn since we were kids so it’s taken a fair bit of research to work out what we’re supposed to do. A sure sign of middle-age, Ed’s bed time reading is now The Lawn Expert and The Country House Garden. The moss is essentially caused by the wet (not much we can do about that up here on the West Coast) and can be made worse by overenthusiastic mowing (one to remember) as well as bad drainage (the drain is still to find…). Who knew? Lawns have drains. 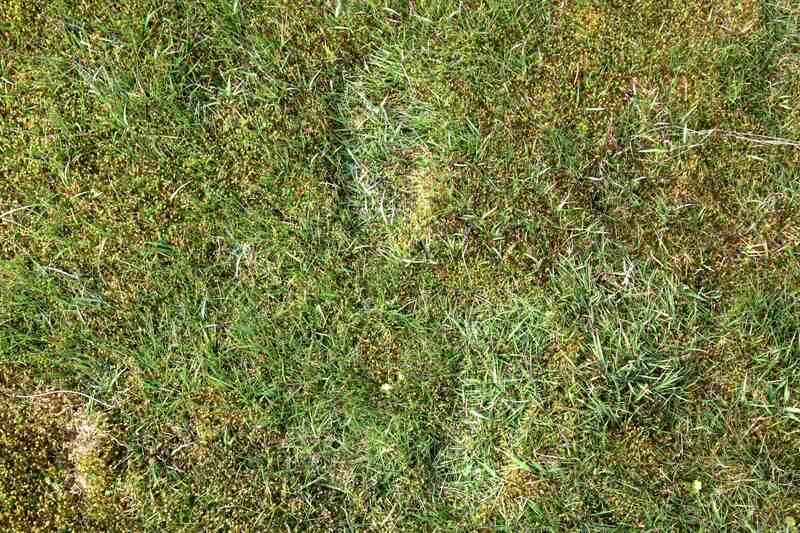 To get rid of the moss we have to spray with moss killer, wait for the moss to die and then ‘scarify’ – basically comb out the moss leaving just the grass behind. We then have to re-seed and re-fertilise. An extra bit of machinery for the scarifying bit is already on it’s way with the new mower. The new mower has also been something of a research project – and suffice to say Ed’s going to have to sell his motorbike to pay for it. I’ve suggested that he wear his helmet and leathers while he’s doing the lawn and he’ll hardly know the difference! We’ve been keenly awaiting the arrival of the mower as the speed at which the grass grows up here has taken on mythical proportions. Mr C, the farmer, keeps reminding us that we better get on with it otherwise we’ll soon be up to our knees and then it’ll all be too late… Although as one of our friends recently pointed out; given the lawn is mostly moss we may have nothing to worry about. Once we get to the actual scarifying bit (in a few weeks) the view from my desk of a sea of green could easily turn into a sea of brown. I think it’s fair to say I’m just a little bit scared…. Categories: acres, castle, country house, countryside, gardens, moving, scotland | Tags: lawns, moss, mow, scarify | Permalink. We knew before we bought the house that we’d like to be as green and energy efficient as possible here, despite the fact that the house is so big. The oil boiler’s been first on our list to try and replace. It’s taken a few weeks of research but I’m now an expert on renewable energy – and could bore you to death with my knowledge of biomass and geo-therm, hydropower and heat pumps. We’d imagined wind turbines, solar panels and ground source might all be options – but the thing that’s going to save us here is wood. Or more specifically wood pellets. It’s a massive job – the installation is big and complicated – and includes a 2 storey high metal box or hopper (to store the pellets) as well as a boiler and 3 accumulator tanks (thermal heat stores) that will take up all the space in both of our out-houses. There’s a whole load of consents to get – listed building, planning and a building warrant – and we need to-scale drawings, diagrams, photographs and specs. We also need a shed-load of cash; the home improvement loan that we had earmarked for just some of the refurb’ is now all going to have to go on the heating. The good news is that the government is providing incentives – and once the new system is in we can apply to recoup some of the money in installments across 20 years. The even better news is that as wood is much cheaper than oil the new system should allow us to have the heating on whenever we need it throughout the winter months which is going to be a life saver. Now I just need to make it happen before the cold weather returns. Categories: castle, country house, countryside, moving, renovation, scotland | Tags: biomass, heating, planning permission, renewable energy, wood pellet boiler | Permalink.